Last weekend was Mother’s Day and I hope everyone had a great time with their mom. Even though it was her special day, my mom spent Saturday afternoon in the kitchen baking up a new pie recipe: Classic Chess Pie! 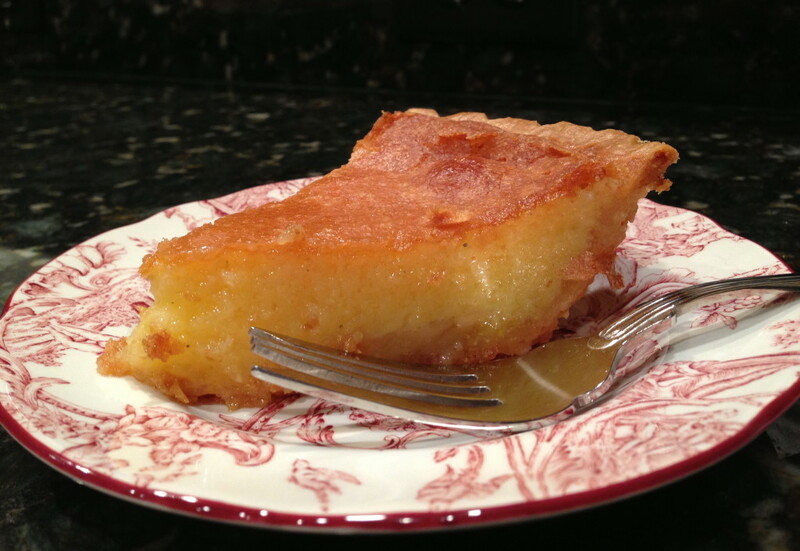 One of Matt’s all-time favorite pie recipes is Furr’s Butter Chess Pie. My mom knew that and decided she would take a stab at recreating the Furr’s classic, and according to Matt, succeeded!! 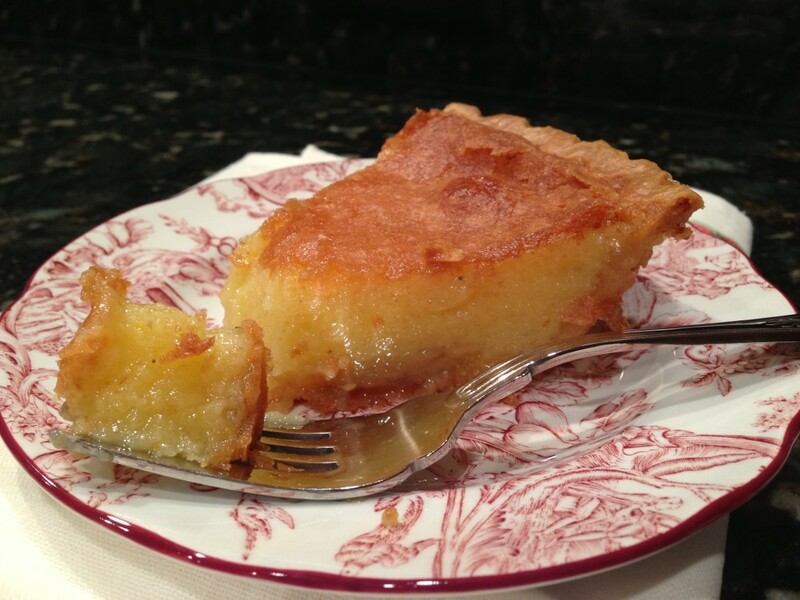 For those that don’t know, chess pie is a classic dessert characteristic of the south. Recipes vary, but are generally similar in that they call for a single crust filled with eggs, butter, granulated sugar and vanilla. Not to be confused with buttermilk pie, which is also a traditional pie of the south, chess pie includes cornmeal; buttermilk pie does not. I must say, I had never tried a chess pie before, and was extremely impressed! Now one of my most favorite pies of all-time, I’m going to request this classic chess pie for every special occasion. Did I mention it’s a breeze to make? With a store-bought crust, prep time takes about 5 minutes. The hard part is waiting for the pie to bake! Enjoy. Recipe from: Southern Living 2000. Fit pie crust into a 9-inch pie plate according to package directions; fold edges under, and crimp. Bake at 425 degrees F for 4-5 minutes. Remove weights and foil; bake 2 minutes more or until golden. Cool. Stir together sugar and next 7 ingredients until blended. Add eggs, stirring well. Pour into pie crust. Bake at 350 degrees F. for 50-55 minutes, shielding edges with aluminum foil after 10 minutes to prevent excessive browning. Cool completely on a wire rack. 9 Responses to "Classic Chess Pie"
Ready to try it because I’m a huge fan of Furrs butter chess pie! Okay…you bring me over a Furr’s butter chess pie and I’ll make you this one. That way we can compare them! Chess pie is my favorite. My father’s favorite. My grandmother’s favorite. And probably back more generations’ favorites! Unfortunately, I was never able to get an accurate recipe for my grandmother’s chess pie. I’ve tried over a dozen recipes trying to match what I remember hers to be and this one is it!! Thank you for sharing this. It has become my young family’s favorite and now I can pass this recipe down!! You sure can’t beat chess pie. Definitely a classic. Hope you enjoy the recipe as much as we did! Finally, a chess pie recipe with cornmeal. I saw a lot of recipes on Pinterest, but not with cornmeal. I baked it tonight and we ate it!! My sister , our eight dogs and myself!! By far the best chess pie that we’ve ever eaten!! Thank you for sharing the recipe!